神戸でレンタルスペースをお探しなら「アートスペースさくらみ」|ホーム > ブログ > In Kobe or Kyoto , Have an interest art experience that combined calligraphy with a Japanese painting ! If you would like to have a great experience with Japanese culture and share it with your friends in your hometown, we suggest you to join our art combining Japanese painting and calligraphy in Kobe or Kyoto. My name is Minobu Matsumoto. I am an owner and representative at Art Space Sakurami in Kobe. I have classes of “Shodo(= Japanese calligraphy)” at Art Space Sakurami. I am working on this workshop with Ms. Soyoka Nakata who has a Japanese art school in Kyoto.We would like you to experience traditional Japanese art that combines Japanese paintings and “Shodo(= Japanese calligraphy)” messages. 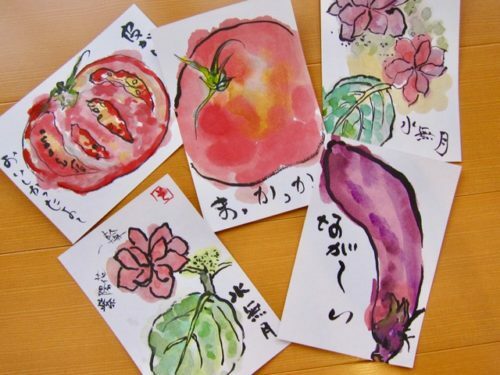 A hand drawn postcards that depicts a seasonal character with hand writing “Shodo” message is called “Etegami” in Japan. You may sand some beautiful photos of sightseeing spots with letters to your friends in your hometown from your destination. It is still nice to send some photos. However, this “Etegami” will definitely impress them. Also, for the foreign residents in Japan, you will be able to enjoy the traditional Japanese culture in a relaxed time. In coming January 2019, we will open a class for foreign residents in Kansai and foreign tourists visiting in Kansai. You can enjoy hand drawing of flowers, fruits, landscapes and other symbols that symbolize the season with brushes suitable for it. 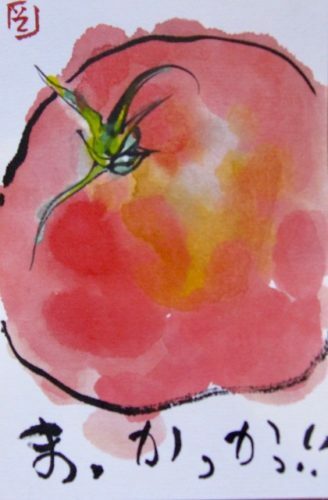 We use traditional Japanese paint and ink. We prepare all the tools that may be used for the activity. Make 3 post cards and a *square board Etegami in one lesson. *square board:40cm x 40cm sized thick board called “Shikishi”. The unique style paper board in Japan. The required time for this activity is approximately 1 hour and 30 minutes. You can choose either Kobe or Kyoto venue. You do not have to prepare or bring any tools for this activity. If you need an apron to prevent getting dirt on your clothes, we will rent out at 100yen. Since our class is a reservation system, please apply by an e-mail.